At Baker Labs, we help medical practices grow by creating websites and online content that attracts new patients. We know that patients today begin their journey to a new doctor’s waiting room with an online search. According to a report compiled by the Pew Research Center’s Internet & American Life Project, 72% of internet users say they looked online for health-related information within the past year, including looking for recommendations for a doctor or healthcare professional near them who could best treat their symptoms. 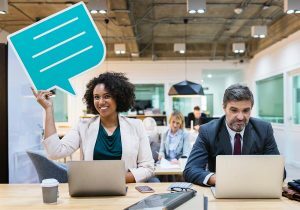 On top of that, 88% of consumers say they are influenced by online customer service reviews and testimonials when making decisions about choosing a product or service, and 58% of consumers are more likely to tell others about their customer service experiences now than they were five years ago. Simply put, people are more influenced than ever by what others have experienced and what’s reviewed online, and 5-star reviews and high Google search result rankings are today’s most powerful marketing tools. Smart medical practices can leverage this increased consumer reliance on online information to a competitive advantage, as one of our clients did. 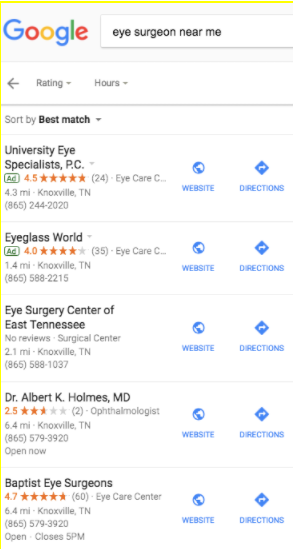 Baptist Eye Surgeons is a surgical ophthalmology group of 11 doctors, and until January of 2017 they weren’t surveying patients or collecting testimonials and reviews. However, they wanted to implement a process of sending out patient satisfaction surveys in order to earn more MIPS credit for the category of clinic improvement activity. According to Misty Booker, Compliance Manager for Baptist Eye Surgeons, the practice chose to contract with Testimonial Tree because they were partnered with their electronic medical records (EMR) software vendor, EyeMD EMR Healthcare Systems, Inc. 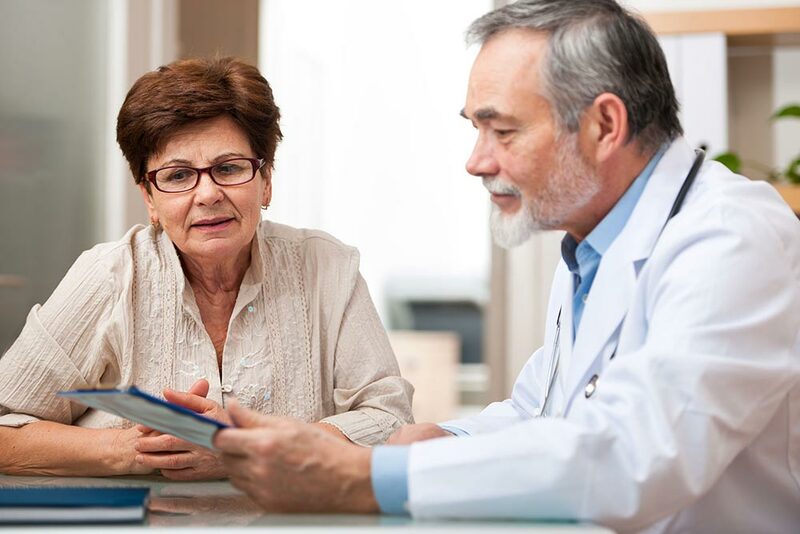 The testimonial generation is integrated into the EMR software that the practice uses daily, so the set-up and implementation was quick and easy. Once set up, the review and survey requests are automatically sent out to patients via email. The practice opted to keep the survey as short as possible to encourage participation. After answering the questions, patients are prompted to also leave a review on commonly used search engines for medical information, like Vitals, Healthgrades, Google, and Facebook. 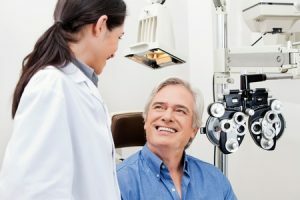 Since implementing Testimonial Tree in early 2017, Baptist Eye Surgeons has generated over 1,260 testimonials with a 29% patient survey completion rate. Plus, simply by sending the survey to patients, the practice earned 20 of the 40 possible MIPS credit points for clinic improvement activity when they previously had none. All I had to do to set it up is go into our EMR and specify which types of visits to send surveys to, and which questions to ask. We wanted surveys to go to both new and established patients who received comprehensive exams, routine exams, and to anyone who needed to be worked in due to an urgent issue or a check-up. That covers most patients. The biggest and unexpected benefit, however, was the impact of the testimonial generation on the practice’s Google rankings. 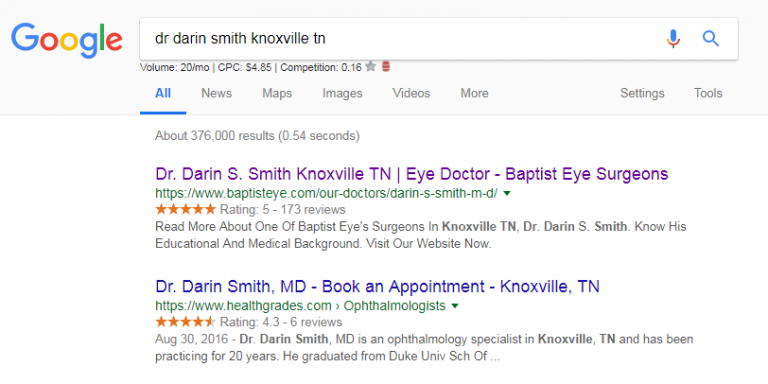 Before asking for and managing testimonials, Baptist Eye Surgeons did nothing to actively encourage patient reviews online. In fact, their online presence was weak overall, and they were falling well behind their competitors in Google rankings. In an effort to improve their online visibility and rank higher on search engines like Google, Baptist Eye Surgeons hired us, Baker Labs, to overhaul their website and create a digital marketing strategy. Knowing that nearly 80% of patients begin their search for doctors or treatments online, our Baker Labs team created a hybrid approach with website content and online ads to help them establish and maintain a prominent ranking in Google searches. One of the Testimonial Tree features that we at Baker Labs took advantage of is the use of implementing reviews on each doctor’s profile. Doctor pages are some of the highest visited pages on the website and we wanted to feature each doctor’s reviews. A bonus was that we were able to implement the reviews from Testimonial Tree on their website in such a way so that their star ranking shows up on the results page in a Google search, as seen in the screenshot above. In the search results, this one small change makes a big visual difference for making the doctor listings stand out from the other results. This increase in Google ranking is due in part because the quality and quantity of reviews that a business receives is one of the most important factors affecting Google rankings. The quality of Baptist Eye Surgeons’ testimonials is certainly high. Booker says that 95% of the reviews are from people who say they love the doctors and the staff and had a positive experience. The main complaint is about wait times. Sometimes, a review will prompt a doctor to be more aware of how he or she interacts with patients. For example, one patient noted in her review that she didn’t feel the doctor listened well to her. After this was brought to his attention, he called her and made sure all of her concerns were addressed. The key takeaway of Baptist Eye Surgeons’ partnership with Testimonial Tree and Baker Labs is that what started as an effort to earn more MIPS credits became a powerhouse marketing tool that also helps the doctors and staff be more informed about how their patients are feeling.